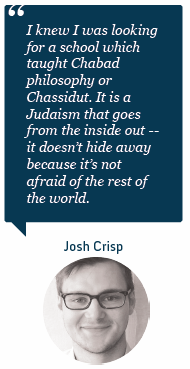 Joshua Crisp’s first real introduction to Judaism was the day he walked into the Chabad House at his school, the University of Sussex in England. 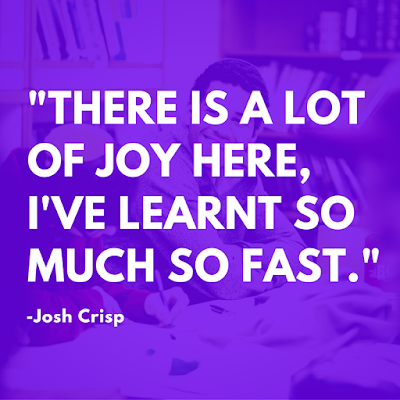 He’s not sure exactly just what pulled him in, but once he got the taste of Jewish life and learning, he found himself wanting more. A junior investment analyst with a degree in economics and finance, Joshua was raised with some sense of his own identity as a Jew but, he said, not much. “Growing up I didn’t know much about Judaism,” he noted. Until he began to “get inspired” at the British South East Coast Universities Chabad House. “Even though I was a real beginner, for some reason I wasn’t intimidated or overwhelmed, just interested, very interested”. That was only one and a half years before he decided to attend the Mayanot Men’s Learning Program, because, although he enjoyed the learning at the campus Chabad, he knew that, after graduation he’d be ready to pick up the pace of his Jewish journey. That’s when he discovered the Mayanot website online www.mayanot.edu, “I knew I was looking for a Chabad yeshiva for the Chabad philosophy and the Chassidut.